Google recently added another option to its Takeout service that lets you export data from your Google account, and the latest addition is one of the most important: Your Google search history. Next to email, there's nothing in your Google account that's more revealing than your search history. Your personal collection of keywords can reveal the status of your personal relationship, the last time you were sick, if you're looking for a career change, and where you're planning to go on vacation. There isn't much you'll be able to do with your search history unless you're a developer, as the archive is just a collection of JSON files. Over time, however, other search services may let you import your Google search history. Here's how to get exporting. Google hasn't added search to its Takeout dashboard yet so you'll have to go to the Google History page to grab your search archive, as first noted by the Google Operating System blog. Once you're there and signed in to your account, click on the settings cog in the upper right corner and select Download. Google offers some warnings before creating your search archive. Next, you'll see a pop-up window with a bunch of information about your archive. Google warns that users should read the whole disclaimer as "it's not the usual yada yada"--a phrase Google typically uses for security- and privacy-related issues. The warnings, however, are mostly common sense security measures: don't download your archive on a public computer, don't lose control of your search archive, and protect your Google account with 2-step verification so that no one else can try and download your search history. Google also warns anyone importing their data into a new service that they should make sure that third-party also lets you export your data. Otherwise, your data will end up stuck in the new service with no way to export it. 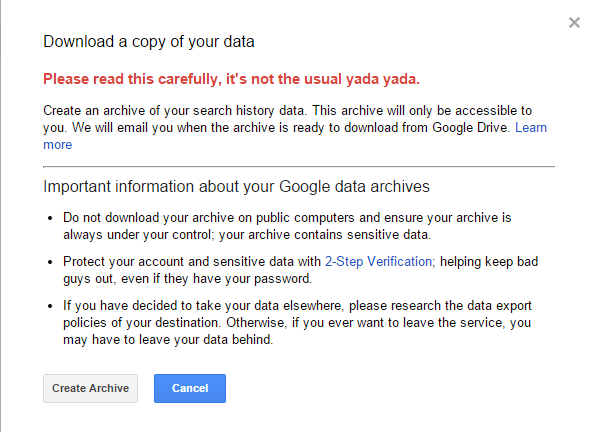 Once you're comfortable with all of Google's warnings hit Create Archive at the bottom of the window. Google will now generate your archive and notify you by email when it's ready. This is the message you'll see once your search history is ready. How long it will take to get that email depends on the size of your archive. Once the email arrives it will let you know you can view the files that make up your search history in Drive, or you can download them directly from Gmail. Google creates a new Drive folder called Takeout where you can always grab your generated search archive or download it. As we mentioned earlier there's not much to see and opening the HTML file included in the archive only shows you a summary of the JSON files in your search history. That's about all there is to downloading your search history. Give it a try.